One of the coolest features Apple added to the 6s and 6s Plus is called Live Photos. Essentially, you snap a still image as always, but a snippet of video (and sound) is also captured about a second and a half before and after you tap the shutter. Think of a Live Photo as an animated GIF. On the 6s or 6s Plus, you’ll see a glyph when you fire up the camera. If the glyph is yellow, the Live Photos feature is enabled, as it is by default. Otherwise, the glyph will be white. You can tap the glyph to toggle the feature on or off. You see a Live indicator in a yellow box while the iPhone is capturing a scene. You can view your Live Photo on your iPhone or on other Apple devices by leaving your finger pressed down on the screen. You can also use a Live Photo as your Lock screen iPhone wallpaper. According to Apple, a Live Photo claims roughly the same amount of space as two photos with the Live Feature turned off do. That means storage shouldn’t become a major issue for most iPhone owners of the 6s or 6s Plus who snap a decent amount of photos, even those of you with the smallest capacity 16GB iPhones. Of course, photos need not stay resident on your phone; you can store images up in the cloud via iCloud. Think of Live Photos more as photos then videos. 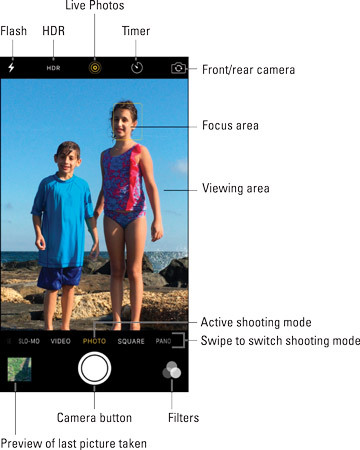 The 12-megapixel still image is still at the heart of what you’re trying to capture. That said, you may want to think about keeping the camera steady for a second or so longer before and after you snap the photo.